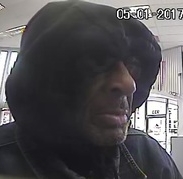 Tacoma Police detectives need your help to identify the suspect responsible for a bank robbery. 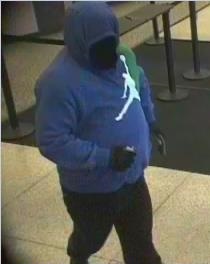 At 5:55 p.m. on Friday April 7th, 2017, the pictured suspect robbed a Wells Fargo bank located in the 2600 block of N. Pearl St. in the City of Tacoma. 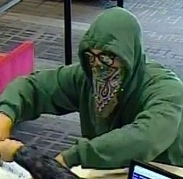 The suspect ran into the bank and aggressively yelled at the tellers to give him money. The suspect grabbed the cash and ran out of the bank, then entered a white vehicle parked nearby. The suspect is described as a male, approximately 5’9” tall, with a medium to heavy build. 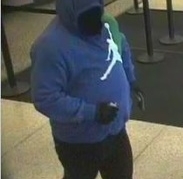 During the robbery the suspect was seen wearing black gloves, a black mask, black shoes, dark pants, and a royal blue hoodie with a white Air Jordan logo on the chest.